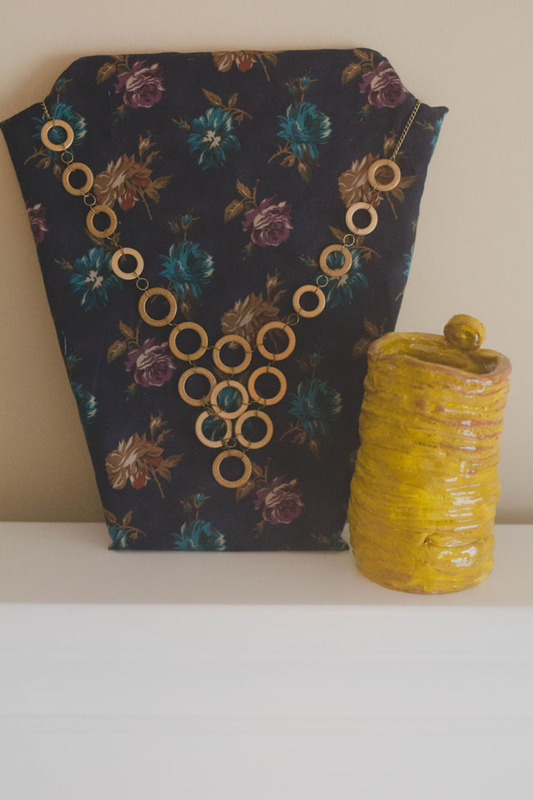 Here is a fun way to display your favorite necklace, I plan to make more in different fabrics to display on my wall. 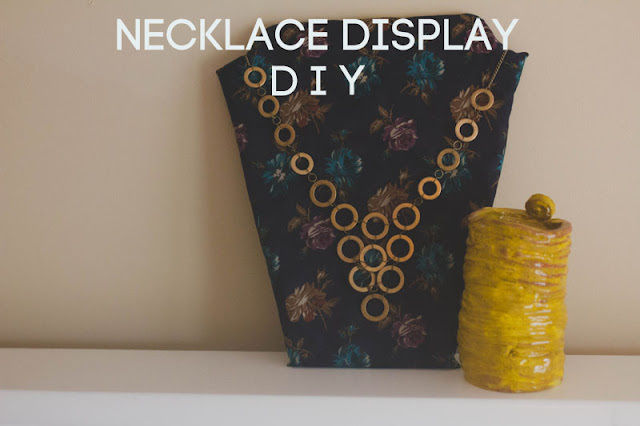 I originally saw a display like this at Urban Outfitters on wood, I loved the idea so as I went to recreate it with wood I realized not everyone can make this out of wood and a skill saw so here is a simple way of recreating the display out of styrofoam! Materials: Styrofoam, fabric, mod podge or glue, x-acto knife, paper & pen. First, I folded my paper in half and drew out a polygon shape with a curved edge at the top and cut out. I traced my symmetric shape on styrofoam and cut out with an x-acto knife. 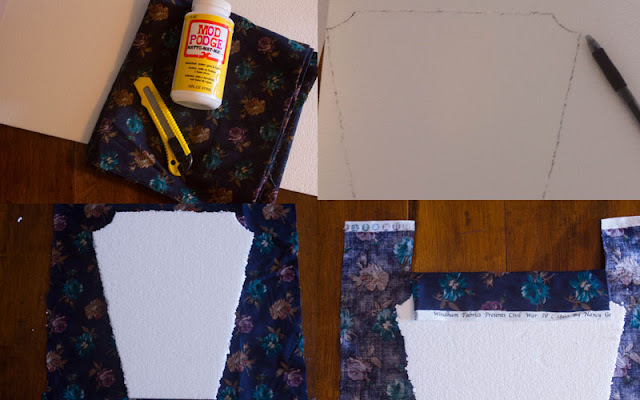 Then fold your fabric over the styrofoam and mod podge! For the edges I cut slits at the top so when I folded the fabric over the curved edge the shape would still be defined. For hanging: If you plan to hang your display on the wall just dig a small hole out of the back with your x-acto knife and place a push pin in- it will stay! This was such an easy project and I think mixing shapes as well as patterns of fabric would make a great display! You can also find a simple necklace DIY to hang on your new display here. P.S. Check out that yellow coil pot I made in the fifth grade! That coil pot is REALLY cool! I'm so glad you've kept it. 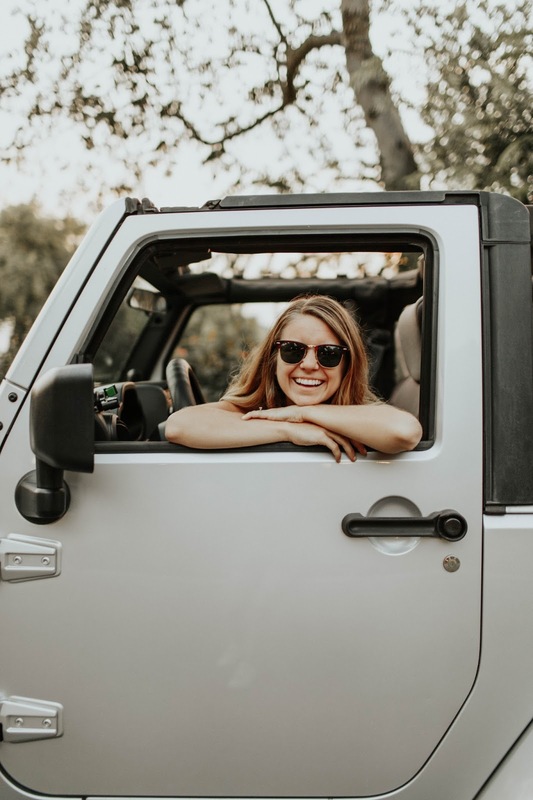 I love this easiest DIY ever. Great idea. Ohhh I have got to make some for my jewelry! These would make great gifts I think. And your yellow pot is so cute! Such a neat idea! And simple too. No doubt I'll be trying this, thanks!